Review Summary: On the whole GANDHI TO HITLER fails to connect. What’s the point of a film where you don’t understand the point of the film? This vague, self-important film is an assault. On the whole GANDHI TO HITLER fails to connect. The film captures Hitler’s last days which he spent hiding in a bunker while the Allied Forces closed in on Berlin at the end of World War ll. This was pretty much a short review in a twitter format that one person sitting right behind me remarked once the end credits started rolling for 'Gandhi To Hitler'. He couldn't have summed it better than these five words as 'Gandhi To Hitler' is exactly what the gentleman commented 'Random'! Shedding light on the movie the film is set in a historical backdrop. When commercial movies are striving to mark their presence in the box office list , the director of the movie tried to come up with a s tory of relevant importance to the society. 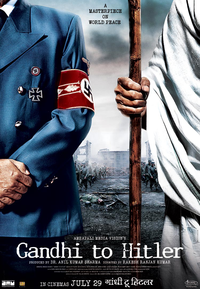 Gandhi To Hitler is devoid of any reason to watch it. All that's left at the end is the angry audience who is put through such ridicule of History.